With the establishment of The Magnes Collection of Jewish Art and Life in July 2010, the unique archives documenting the Jewish experience in Northern California were gifted to The Bancroft Library by the former Judah L. Magnes Museum in Berkeley. The Magnes archives of Western Jewish Americana have served as an important source for several foundational studies of Jewish life in California. Researchers often relied on the combination of Magnes and Bancroft collections in their work. Now, the physically integrated collections of both institutions bring unique resources under one roof, making them even more accessible for teaching and research. The inaugural exhibition, Gained in Translation: Jews, Germany, California circa 1849, draws on art, artifacts, books, and archival materials from The Magnes Collection of Jewish Art and Life, The Bancroft Library, and the Levi-­‐Strauss Archives to stretch the historical and geographic boundaries of San Francisco Jewish history, connecting the history of the Jews in Germany before 1849 to the establishment of the Jewish community in the San Francisco Bay in the second half of the 19th century. The focal point of the exhibition is the renowned painting by Moritz Daniel Oppenheim Lavater and Lessing Visit Moses Mendelssohn (1856), one of the most reproduced works in the Magnes Collection, often used to illustrate the cultural dialogue framing the social and cultural emancipation of the Jews in Germany. 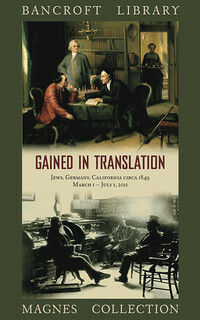 The decade in which this work appeared was pivotal for German Jews: their hopes for emancipation were challenged by the failed revolution of 1848-­‐49, which also spurred emigration to the United States, including to San Francisco, where the Gold Rush provided new opportunities of social success and civic engagement.